Come one, come all to Alphabet Al's exciting alphabet circus! There's plenty of clowning around as children learn to recognize letters A to Z and practice naming words that begin with each letter. Attention-grabbing acrobats, elephants, dancing dogs, and other amazing circus performers keep preschoolers or kindergartners entertained and help build vocabulary. 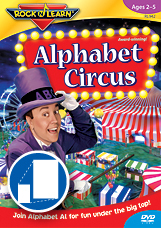 Rock 'N Learn Alphabet Circus is sure to be a favorite with your child. Combines live action-actual children-with vibrant animated fun! Here is the perfect way to get your child ready for starting school. Young learners will enjoy all of the kindergarten readiness activities, including learning to count objects by color, shape, or a combination of both. 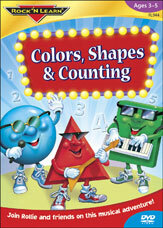 Even gifted children will be challenged by advanced colors (maroon, turquoise) and shapes (polygons, ellipses).